Speciation is how a new kind of plant or animal species is created. Speciation occurs when a group within a species separates from other members of its species and develops its own unique characteristics. There are four major variants of speciation: allopatric, peripatric, parapatric, and sympatric. Speciation is how a new kind of plant or animal species is created. Speciation occurs when a group within a species separates from other members of its species and develops its own unique characteristics. The demands of a different environment or the characteristics of the members of the new group will differentiate the new species from their ancestors. An example of speciation is the Galápagos finch. Different species of these birds live on different islands in the Galápagos archipelago, located in the Pacific Ocean off South America. The finches are isolated from one another by the ocean. Over millions of years, each species of finch developed a unique beak that is especially adapted to the kinds of food it eats. Some finches have large, blunt beaks that can crack the hard shells of nuts and seeds. Other finches have long, thin beaks that can probe into cactus flowers without the bird being poked by the cactus spines. Still other finches have medium-size beaks that can catch and grasp insects. Because they are isolated, the birds don’t breed with one another and have therefore developed into unique species with unique characteristics. This is called allopatric speciation. There are five types of speciation: allopatric, peripatric, parapatric, and sympatric and artificial. Allopatric speciation (1) occurs when a species separates into two separate groups which are isolated from one another. A physical barrier, such as a mountain range or a waterway, makes it impossible for them to breed with one another. Each species develops differently based on the demands of their unique habitat or the genetic characteristics of the group that are passed on to offspring. When Arizona's Grand Canyon formed, squirrels and other small mammals that had once been part of a single population could no longer contact and reproduce with each other across this new geographic barrier. They could no longer interbreed. The squirrel population underwent allopatric speciation. Today, two separate squirrel species inhabit the north and south rims of the canyon. On the other hand, birds and other species that could easily cross this barrier continued to interbreed and were not divided into separate populations. When small groups of individuals break off from the larger group and form a new species, this is called peripatric speciation (2). As in allopatric speciation, physical barriers make it impossible for members of the groups to interbreed with one another. 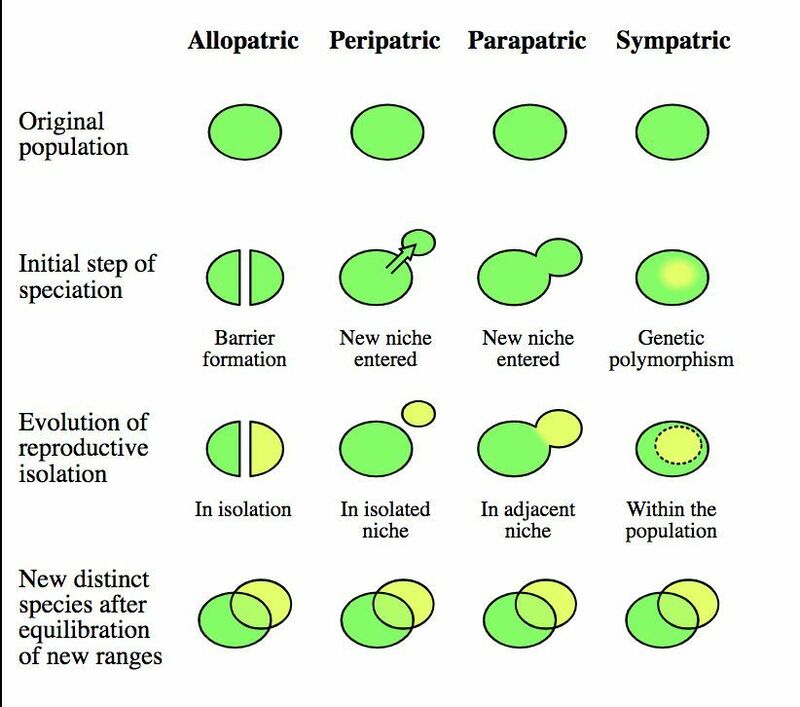 The main difference between allopatric speciation and peripatric speciation is that in peripatric speciation, one group is much smaller than the other. Unique characteristics of the smaller groups are passed on to future generations of the group, making those traits more common among that group and distinguishing it from the others. In parapatric speciation (3), a species is spread out over a large geographic area. Although it is possible for any member of the species to mate with another member, individuals only mate with those in their own geographic region. Like allopatric and peripatric speciation, different habitats influence the development of different species in parapatric speciation. Instead of being separated by a physical barrier, the species are separated by differences in the same environment. Parapatric speciation sometimes happens when part of an environment has been polluted. Mining activities leave waste with high amounts of metals like lead and zinc. These metals are absorbed into the soil, preventing most plants from growing. Some grasses, such as buffalo grass, can tolerate the metals. Buffalo grass, also known as vanilla grass, is native to Europe and Asia, but is now found throughout North and South America, too. Buffalo grass has become a unique species from the grasses that grow in areas not polluted by metals. Long distances can make it impractical to travel to reproduce with other members of the species. Buffalo grass seeds pass on the characteristics of the members in that region to offspring. Sometimes a species that is formed by parapatric speciation is especially suited to survive in a different kind of environment than the original species. Sympatric speciation (4) is controversial. Some scientists don’t believe it exists. Sympatric speciation occurs when there are no physical barriers preventing any members of a species from mating with another, and all members are in close proximity to one another. A new species, perhaps based on a different food source or characteristic, seems to develop spontaneously. The theory is that some individuals become dependent on certain aspects of an environment—such as shelter or food sources—while others do not. A possible example of sympatric speciation is the apple maggot, an insect that lays its eggs inside the fruit of an apple, causing it to rot. As the apple falls from the tree, the maggots dig in the ground before emerging as flies several months later. The apple maggot originally laid its eggs in the fruit of a relative of the apple—a fruit called a hawthorn. After apples were introduced to North America in the 19th century, a type of maggot developed that only lays its eggs in apples. The original hawthorn species still only lays its eggs in hawthorns. The two types of maggots are not different species yet, but many scientists believe they are undergoing the process of sympatric speciation. Artificial speciation (5) is the creation of new species by people. This is achieved through lab experiments, where scientists mostly research insects like fruit flies. The Hawaiian islands are home to some of the most stunning examples of speciation. Over 1000 species of fruit fly have developed there and are found nowhere else on Earth! There are nearly 150 species of the small anolis lizard on the islands of the Caribbean Sea, all of which descended from as few as two initial species. when a species divides into separate groups which are isolated from one another, and a new species develops. process by which people create a new species of organism by selective breeding. region near the Caucasus Mountains, between the Black Sea and the Caspian Sea. particular feature of an organism. chemical element with the symbol Pb. when a species is spread out over a large geographic area, but only reproduces with local species, resulting in the development of a new species. when small groups of individuals break off from the larger group and form a new species. development of many similar species in a single habitat, each with a different specialization. chemical element with the symbol Zn.